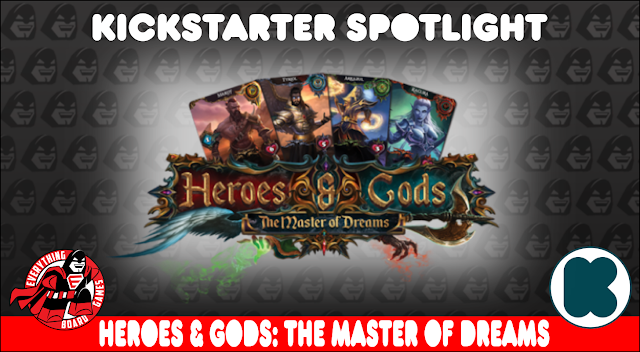 Heroes & Gods: The Master of Dreams is a hero-builder board game set in a fantastic world where mortal and immortal beings live side by side. 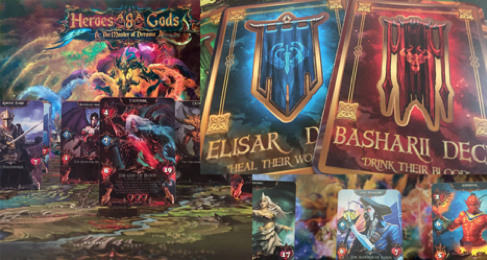 Your mission is to explore the realm and travel across the regions belonging to the four dominant factions: the spectacular cities of the Aedolas mages, the mysterious seas of the Takan warriors, the bountiful mountains of the Elysar healers, and the hot magical desert of the Basharii blood lords. The purpose of the journey is to uncover the mystery that surrounds Death and challenge her avatar to an epic battle. If you survive Death's wrath and defeat her in combat you win the game and become a god yourself. 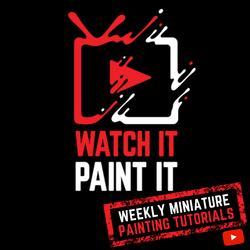 Mechanics are based on an intricate system of PvEvP where your goal is to defeat the challenges ahead of you as a group while trying to shine and improve your Hero as an individual. The entire game is based on social interactions between players offering options such as freedom of choice, unhindered dynamic diplomacy, free trade and auctioning, loot negotiations while being entirely co-op, or, if you chose so, free-for-all. The very core of the game is freedom of choice. You won't have to play this game constrained by odd rules entombed in a bible-like rule book or leave yourself at the mercy of a pair of dice. You can customize your Hero with weapons, armors, spells, potions, and even companions. The rest of your loot goes into your backpack along with the soul coins you have earned. Every decision you make is going to be important, from helping another party member defeat a monster, fulfilling a quest or lending financial help down to demanding items at the tip of your sword, dictating power moves, betraying your allies or stealing their hard earned loot, everything is possible in this game. We worked really hard to provide a level of freedom you will rarely encounter in any other game. It is a highly strategic game primarily for the fact that it does not constrain you to a set type of player-to-player interactions. YOU can play the game however you want, but keep in mind that the group is more powerful than the individual and REPUTATION, DIPLOMACY, and TRADE will actually provide the means to emerge victorious in every combat situation. Ascension (solo or free-for-all/coop) - Form a party of Heroes and challenge Death's avatar to battle. 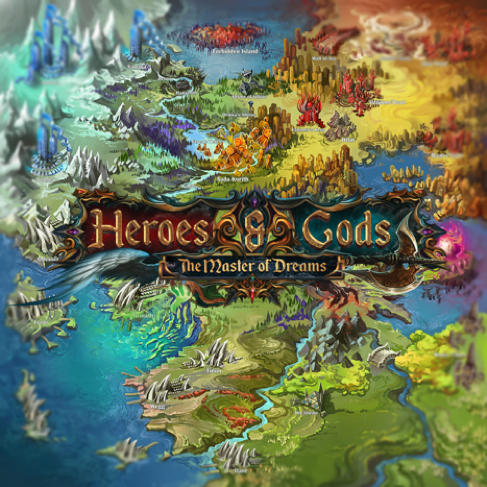 Campaign (solo or coop) - Fulfill The Master of Dreams quest. The game has scalable difficulty levels. Depending on how many players are sitting at the table, combat will increase/decrease in difficulty. 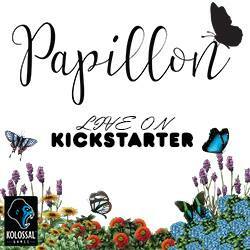 Coming to KICKSTARTER this summer. 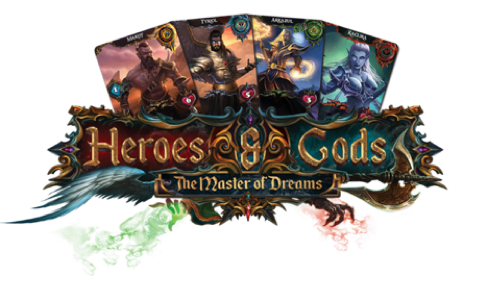 Website : You can find more information about the game at https://www.heroesandgods.net - Visit "THE GAME" section to view components and read more about Heroes.